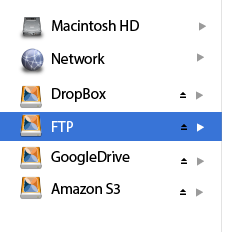 Using FTP Clients used to mean learning a new interface. WebDrive is the FTP client you already know how to use. Rather than running a separate FTP program, WebDrive becomes part of your Windows or Mac desktop. Access files from within the applications that you use every day, or from the convenience of Windows Explorer or Mac Finder. 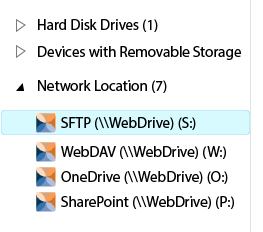 By mapping a network drive to FTP and SFTP Servers, WebDrive lets you access each server as if it were a drive on your computer. You can even map unique drive letters to different folders on your server. Supporting both SFTP and FTP/S, WebDrive is a secure ftp client. Stored passwords are also encrypted, to further improve security. And WebDrive’s advanced caching makes the software fast, as well as secure. Although WebDrive is powerful, it’s the easiest FTP Program you’ll ever use. Setup typically takes less than 5 minutes, and then access to your server files is truly seamless. Try it now!